Periscope is officially launching its beta save function as a stable feature, introducing search functionality and rolling out a new feature that will let you trade off between your phone and a DJI Drone during a live-stream. In the Periscope app, you’ll soon see a new feature that lets you search for livestreams and saved broadcasts. You can type something like ‘TNW’ and find any broadcast with that term in the title or topic description. There will also be hash-tagged topics like #food, #travel and #music which will surface streams in those categories. Two new categories will help you welcome new users (First Scope) and find the ultimate in live-streaming (GoPros and Drones). The #save feature, which recently rolled out as beta, is still technically not ready for primetime, but Periscope says it will be in the coming weeks. It will have all of the same functionality we enjoy now; you can save streams indefinitely without the need to upload later to Vimeo or YouTube, and they’ll live forever in your Twitter timeline, much like Facebook’s Live Video sticks around in your feed. You can still choose to have broadcasts vanish after 24 hours, and delete them at any time. DJI is also getting into the live-streaming game, and will support a handoff feature that lets you swap between a phone and a drone while live-streaming. Periscope tells us that you’ll also be able to sketch over your streams, even when the drone is broadcasting. All you have to do is use your phone with the DJI remote and you’re in business. Currently, only the DJI Inspire, Phantom 4, Phantom 3 Professional, Phantom 3 Advanced and Osmo are supported. And if you’ve got a GoPro, Periscope now lets you swap between all three. Get ready for some extreme live-streams. Drone streaming will only be made available on iOS. 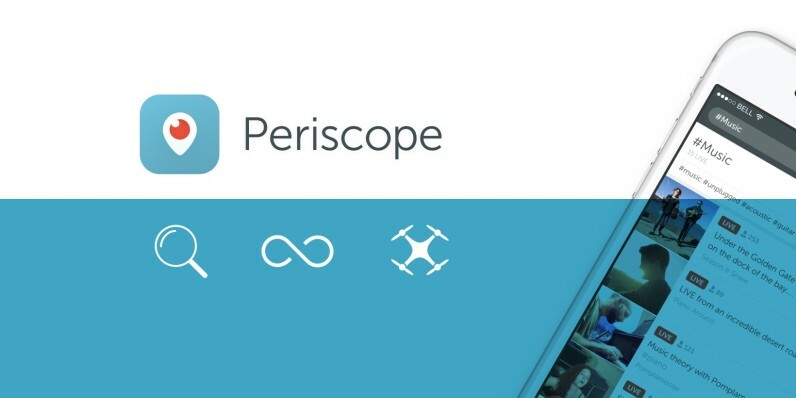 Periscope says its search and save features will roll out to both Android and iOS over the next few weeks.